The Sanken Production and Live microphones provide a wide range of pure, transparent sounding shotguns, lavaliers and head worn mics for TV and film production, broadcast and live performance. They are designed and meticulously engineered in Japan using the latest technology and include many innovative features such as membranes impervious to humidity and temperature change. The result is a set of mics that have phenomenal frequency response, accurate off axis response, exact patterns, exceptional shotgun directivity and rejection, minimal proximity effect, low noise and high SPL tolerance. For information about the Sanken Chromatic range of 7 Professional studio microphones for music, go to sankenchromatic.com. plus24 is based in Los Angeles, the exclusive distributor of Sanken Microphones and Accessories in the USA, Canada and South America. Started in 1986 as Developing Technologies Distributors, the company was renamed in 2002 as plus24 to signify the full commitment to the highest possible standards. Today plus24 reaches out to markets worldwide and continues to work closely with manufacturers to design, develop and introduce truly unique and valuable tools for the wide world of entertainment production. Please use this form for sales, support, press and general information requests, USA and Canada only. To register a product use the Product Registration form on this page. Note: We only manage Sanken Mic sales and support in North America. For other countries please visit the Sanken Japanese site. Please register your Sanken Production and Live Mic product by filling out this form - USA and Canada customers only. CS-1e, CS-2, CSR-2, CS-3e, CSS-50, CSS-5, CMS-10, WMS-5, COS-11D, COS-22, COS-11D-HWM. For Sanken Chromatic Studio Mics for music please visit sankenchromatic.com. Only register if you live in USA or Canada. 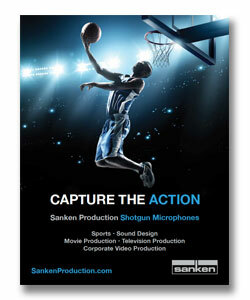 Sanken Microphone Co., Ltd. is one of the leading professional microphone manufacturers in Japan. The company was established in 1926, creating microphones for professional use. In 1933, Rihei Takeuchi, a founder of the company obtained his first patent for the antiagglomeration of carbon particles in carbon microphones, and generations later the Takeuchi family carries on a tradition of scientific craftsmanship. In 1975, the CMS-2 M-S type microphone was developed, the first in a range of high quality professional studio microphones known in the USA as Sanken Chromatic. The CMS-2 was their first mic to use a titanium diaphragm resistant to temperature changes and humidity. The CU-41 was introduced in 1982 with an innovative two way capsule for low and high end frequency capture. Other mics in the Sanken Chromatic range followed at the turn of the 21st century with the latest addition, the CU-51, becoming available in 2016. In its 90 year history the company has mastered the art and technology of engineering the purest most transparent sounding mics.